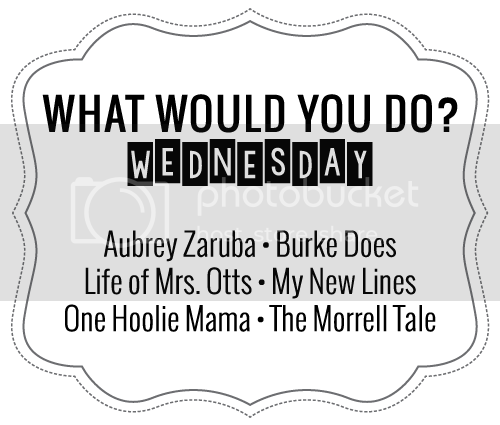 i'm excited for a new year of the what would you do linkup. kimberly is having a new little babe and decided to take a break for a while. i'm holding out hope she'll be back to blogging,but if not go check out her etsy shop and die at the cuteness. i have some new hosts, and i'm really excited to welcome emilie, sharlee, erin, suzanna, and tayler to the linkup. this month we want to know WHAT WOULD YOU DO...with 1 hour of free time? this question is a little tricky for me because technically i have a lot of my own time. besides the hours i am obligated to be at work (and even that is flexible), i am completely in charge of my own schedule. even though most of my time is my own, i rarely feel like i have free time. i keep myself pretty booked, and that's the way i like it. in theory i would read a book or do a craft or color or sew something or clean up my pinterest, but in reality if i had an hour of free time i would probably spend it catching up with a friend. as much as i love all of those other things, i LOVE talking to people the most. we want to know WHAT WOULD YOU DO...with 1 hour of free time. we're not big on rules so grab a button, link up your posts, and hop around. I try and give myself some free time every day during "quiet time" and after bed. I'm ashamed to say that I often watch Netflix hahaha! BUT! When my shop is in full swing I pair it with cutting fabric a lot of the time too, so two birds one stone kind of thing :) Thanks for the sweet plug to my shop! You're too kind! I try to make time for fitness and my blog, but I neglect myself sometimes. I would spend the hour pampering myself or taking care of whatever my body needs. I would read a book! Good question! If I'm not working, I'm with the kids. If I'm not with the kids, I feel guilty if I'm not doing something productive :) I guess if I had an hour to do whatever the heck I wanted and didn't have any errands to run, I would probably try to work on my scrapbooks. I'm so far behind, it's kind of sad. If it wasn't for Rhys's nap, I probably would waste free time, too by watching Netflix or something. Catching up with a friend is good for the soul! That's such a great way to spend time! Oh man.... Probably do nothing. Lol, just relax and read a book, or watch Netflix. Maybe color or take photos!